The tantalizing details in Dante's work led a number of medieval scholars and artists to attempt a topography of the Divine Comedy. "During the fifteenth century, the Florentine architect Antonio Manetti decided that one could gather the information presented in [The Inferno] and extrapolate from it to map out precisely the size, shape and location of Dante's Hell." Padron 2007, 261. For Manetti's images, see ID ##1004.01-.07. Manetti's analysis was reflected in Botticelli's famous Chart of Hell and guided scholars and artists for centuries thereafter. Parker 2013, 87-89. Manetti's posthumous work presents "the first printed maps of Dante's hell and, as such, the beginning of a venerable tradition." Cachey 2007, 453. Venerable indeed: 350 years later, Michelangelo Caetani published "The Content of Dante's Divine Comedy Described in Six Plates" (ID ##1071.01-.07), applying modern chromolithography to Manetti's 15th Century ideas. Caetani, the Duke of Sermoneta, was a leading Dante scholar of his time. His work was printed by the monks at Monte Cassino. See generally Padron 2007, 260-65. For critical views on the notion of mapping the Inferno from the text of Dante, see Gilbert 1945; Kleiner 1994. Benivieni, Girolamo. Dialogo di Antonio Manetti: Cittadino fiorentino circa al sito, forma, & misure del lo infero di Dante Alighieri poeta excellentissimo. Florence: F. di Giunta. 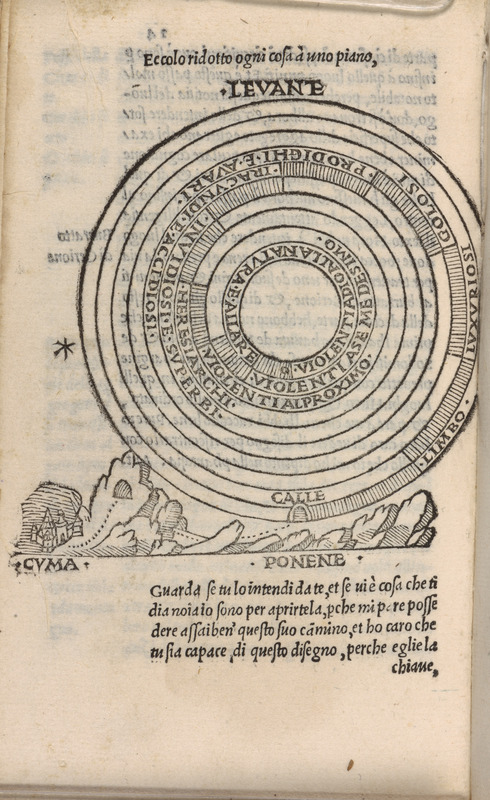 Manetti's work was published in 1506 with an edition of the Divine Comedy|the copy in the collection is from a separate edition, undated, which "may be of about 1520." Gilbert 1945, 289 n. 3.